UN Secretary General António Guterres warned that the destruction of the Yemeni port of Hodeidah - a vital lifeline for millions of starving civilians - could trigger a "catastrophic" situation. Medics and military sources say at least 149 people have been killed in 24 hours of heavy clashes as government loyalists, backed by a Saudi-led coalition, fight to oust Houthi rebels from the Red Sea city. "If the port at Hodeidah is destroyed, that could create an absolutely catastrophic situation," Mr Guterres said during a trip to Paris. Yemen is already facing a "disastrous" humanitarian situation, Mr Guterres said, adding: "The hostilities must stop." The Saudi-led coalition currently "appears determined to take Hodeidah, which in my opinion will still not allow the real start of a political solution", Mr Guterres said. "The fighting must stop, a political debate must begin, and we must prepare a massive humanitarian response to avoid the worst next year." 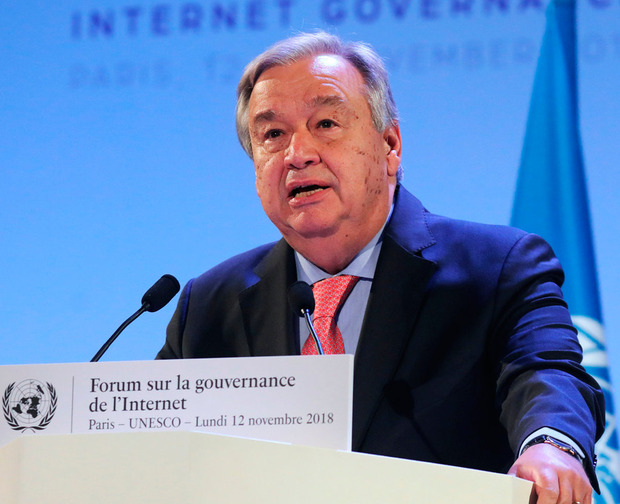 Mr Guterres said there was "an opportunity to make the direct parties in the conflict - the Houthis, the government, the United Arab Emirates and Saudi Arabia - understand this is ultimately a war that no one is winning." He added there was "a consensus, between the United States, Russia, Europe and many states in the region, that it is time to end this conflict". "The early reaction has been relatively positive but in my opinion things are frozen due to the Hodeidah situation". The UN is already providing food aid to eight million Yemenis but that number could reach 14 million next year, Mr Guterres warned. Street battles raged in residential areas of Hodeidah, forcing medical staff to flee the largest hospital, as Houthi insurgents tried to repel forces backed by the Saudi coalition. The coalition has renewed its offensive on Hodeidah as Western allies, including the US, called for a ceasefire to support UN-led efforts to end the nearly four-year war that has killed more than 10,000 and pushed the country to the brink of starvation. Medical sources at al-Thawra hospital said several staff members and patients able to move had fled. It was not immediately clear how many patients remained inside. Hospital spokesman Khaled Attiyah said doctors and nurses continued their work in departments such as intensive care, the burns ward and the emergency room "despite the panic". Last week, rights groups said the Houthis had raided the hospital in the city's eastern suburbs and posted gunmen on the roof, endangering doctors and patients. The UN and aid groups have warned a full-scale assault on Hodeidah, an entry point for 80pc of the country's food imports and relief supplies, could trigger a famine. In a telephone call with Saudi Crown Prince Mohammed bin Salman on Sunday, US Secretary of State Mike Pompeo reiterated Washington's call for "a cessation of hostilities and for all parties to come to the table to negotiate a peaceful solution".